We are pleased to offer for sale this beautifully presented family home situated within a short level walk of the shops, schools and other local amenities. The classic 1930s home has been substantially extended and remodelled over the years to provide ideal layout for a modern family with open plan kitchen/family room and three further reception rooms. 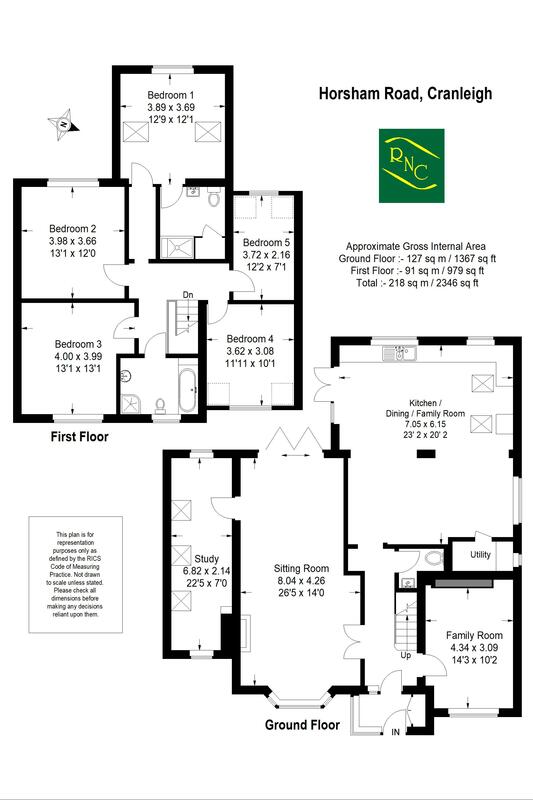 Upstairs there are 5 bedrooms including an impressive master bedroom with vaulted ceiling and en-suite shower room. The property enjoys a large Westerley aspect rear garden with stone paved patio entertaining area and pathway. We highly recommend arranging to view the property in order to fully appreciate this quality home. WALKING DISTANCE of High Street. Superb family home featuring large OPEN PLAN kitchen dining room, three further reception rooms. Master Bedroom with VAULTED CEILING and En-Suite shower room, Four further Bedrooms. Westerly aspect rear garden. From our office turn left into the High Street and proceed to the second mini roundabout. Bear right into the Horsham Road and Three Oaks will be found on the right hand side opposite the turning to 'The Drive'. Cranleigh is a large, attractive and vibrant village on the edge of the beautiful Surrey Hills, midway between Guildford and Horsham. It has a fantastic mix of shops, pubs, restaurants and cafes, from independent retailers to well known brands including Marks and Spencers Food Hall and Sainsburys, as well as a weekly market. The village boasts a huge array of clubs and societies to suit many tastes as well as a leisure centre, arts centre, library, childrens playgrounds, a choice of golf courses and a number of churches. Cranleigh is popular with families, with an excellent range of nurseries and well regarded private and state schools. The nearby towns of Guildford, Godalming and Horsham offer mainline train services to London. Comprising; wash hand basin with mixer tap, concealed cistern WC, fully tiled. Space and plumbing for washing machine and tumble dryer with granite work surface over. Superb master bedroom suite featuring vaulted ceiling with velux windows, rear aspect overlooking the garden. Comprising; fully tiled shower enclosure with thermostatic shower, wall mounted wash hand basin with mixer tap, close coupled WC, chrome heated towel rail, airing cupboard housing hot water cylinder with fitted shelving over. Spacious double bedroom, rear aspect, range of fitted wardrobe cupboards. Double bedroom, front aspect, range of fitted wardrobe cupboards. Rear aspect. This room is currently used as a dressing room with a range of fitted clothes rails, shelves and drawers. Contemporary fitted bathroom comprising; fully tiled shower enclosure with thermostatic shower, bath with mixer tap, wash hand basin with mixer tap and storage cupboard under, close coupled WC, tiled floor, chrome heated towel rail. The property is approached by a gravel driveway and parking area providing parking for several vehicles. Side access is provided via a paved pathway through a wooden gate. The garden itself is a generous size and benefits from a Westerly aspect. Primarily laid to lawn the garden is bordered by some shaped flower beds and some mature trees. A stone paved patio adjoins the rear of the property of which the doors from the kitchen and living room open onto. Mains water, gas and electricity.